Naaaaaaaaants ingonyama, bagithi Baba! 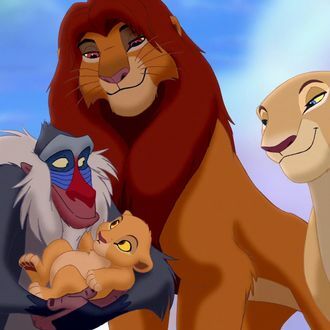 Disney on Wednesday announced it’s reteaming with director Jon Favreau on a “reimagining” of The Lion King, which will include songs from the original film. Though the news is unexpected, it shouldn’t come as a complete surprise: The studio is in the middle of an effort to remake its animated classics — including Cinderella, Pete’s Dragon, and the upcoming Beauty and the Beast — and The Lion King remains one of the most-loved films of Disney’s 1990s golden age. Favreau’s remake of The Jungle Book used CGI motion-capped animals alongside real human boy Neeli Seth, and it seems likely that The Lion King, which has no human characters, will use similar methods for its animal leads. Millennials, that troubling feeling in your stomach is you now knowing what it feels like to be Gen-Xers. Andy Serkis, start practicing your hyena laugh now.